Valentine’s Day is around the corner, and it’s time to make cards for those you love. 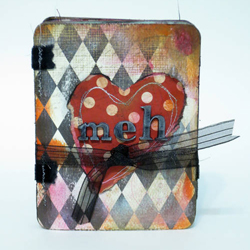 But how about we spread it out and make cards for those you wouldn’t normally send cards to? Here are some Valentines for those others on the list that might not count as your true love. pottermouth made a Mediocre Valentine for someone who is just ….ok. This fold out atc book contains sentiments like “You’ll do. I guess.” and “I don’t not like you.” It’s perfect for that special person who’s never going to truly leave the friend zone. 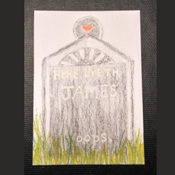 blupaisan has an interesting way to remember her exes on Valentine’s Day: she draws a nice tombstone with their name on it, along with a saying that they constantly used during their time together. But hey, there are still hearts on each tombstone! Everyone deserves love, even monsters! 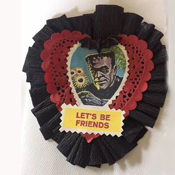 It’s amazing how romantic Frankenstein’s monster can be, when surrounded by lace and crepe paper. kittykill added the sweet sentiment: “Let’s Be Friends”. 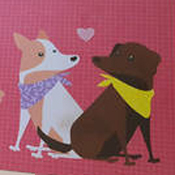 Here’s a detail of a card that TheMistressT helped her dog Delia make for her favorite vet. Looks like talent runs in the family. 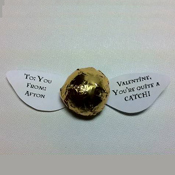 patty_o_furniture used bouncy balls from the Dollar Store to make a slew of Golden Snitches valentines for her Harry Potter-loving daughter to pass out to her classmates. What fun! Don’t leave Valentine making until the last minute, and this year, think about making some that are unconventional, just for the fun of it. Check out the Valentine’s Day board for for great ideas!